Last week we had a little adventure with the fire sprinkler system at Hilltop Artists in Residence which shut down the glassblowing at the hot shop for a day. 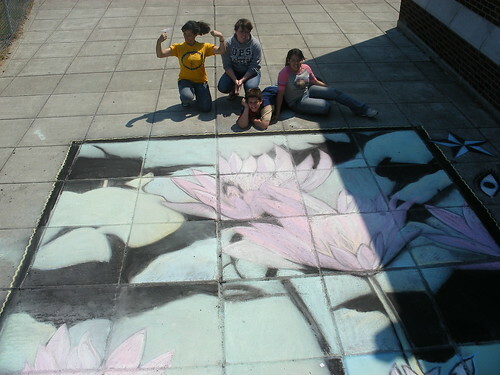 So we took the students outside and did a collaborative chalk project. We had a blast!! by Courtney on 8/10/2008 @ 8:54am Wow Kathy that's gorgeous! What a great job they did. by kathy on 8/10/2008 @ 9:52am Thanks! What's cool is that we had about 10 different kids working on it throughout the day. I took a photo and cut it into squares, each kid pulled one out of a bowl and proceeded to the pre-number concrete squares to create their mini masterpiece. Each kid had their own style, but when it was done it all sorta came together. Fortunately for us the area outside the hot shop is comprised of perfect squares of concrete, so it was easy to put together. We just wished we had more vibrant colors...that woulda been great. 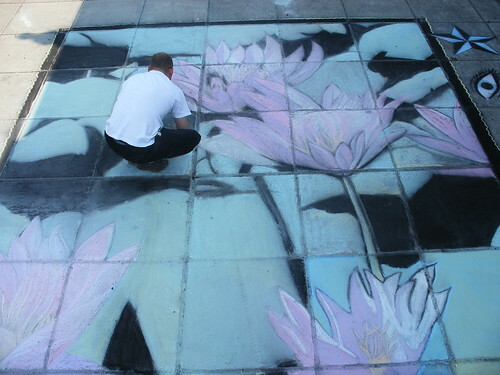 This could be a cool project for Frost Park...dontcha think? by Dave_L on 8/10/2008 @ 12:16pm Neat idea! That is an ideal layout of concrete there, and there are probably some several other neat ways to piece one large work together or otherise utilize that perfect grid. by Erik on 8/10/2008 @ 2:25pm So we took the students outside and did a collaborative chalk project. We had a blast!! Very impressive and professional looking piece. Each square is filled out so nicely. Under your guidance, they will be ready to enter the Frost Park contests in no time. 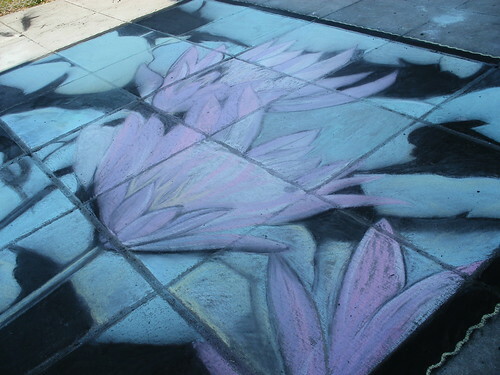 Let those kids give those 20, 30, and 40-something chalking regulars a run for their money(or chalk dust or whatever)! by Girl Who <3 JUNK on 8/10/2008 @ 5:51pm WOW! Kids are so super great! by NineInchNachos on 8/10/2008 @ 8:36pm lookin good hilltop artists! by dawntown on 8/10/2008 @ 9:08pm Ill be a ripe 32 on August 19. And yes, give us a run...we need some fresh blood. It would be really neat to transfer that concept to Frost Park one Friday! !